Since the Super Bowl is coming up this weekend I thought I'd repost a few of my favorite treats! We'll be having a couple of these this Sunday! Wash mushrooms and remove stems. 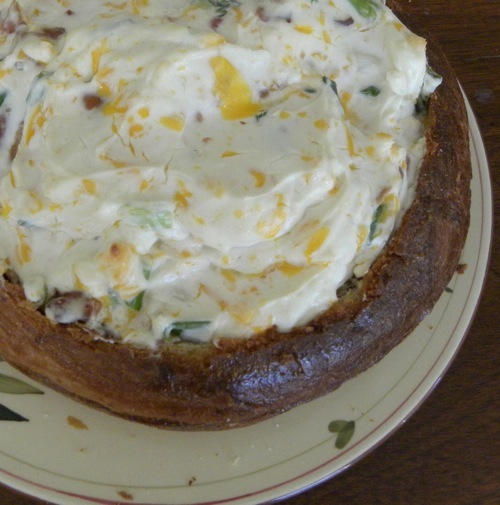 In a bowl combine the cream cheese, the bacon (crumbled) the onion and the mayonnaise. Squeeze the lemon over the mixture. Mix well. With a spoon, spoon the mixture into the mushrooms. Cook at 250 degrees for 10 minutes (if you overcook these they get really runny... If they are just right they shouldn't be runny!). As a Californian I was raised on Artichokes. I thought that everyone ate them. Around the time I went to college I realized that wasn't the case. Thankfully Paul and Sadie both love them. They're the basis for the next recipe. 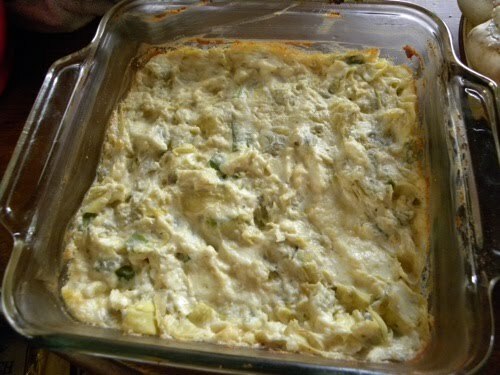 Combine all ingredients in a baking pan. Mix well. Cook at 350 degrees for 30 minutes until golden on top. Serve with crackers or toasted bread. Layer the refried beans on a plate. Spread to cover entire surface. Cover refried beans with sour cream. Spread to cover the beans. Cut the avocados and remove the pits. Scoop the avocado into a bowl and mash. Add a dollop of mayonnaise (I usually use 2-3 tbs) and a dollop of salsa (I usually use around a 1/2 cup... my mom probably uses around a 1/4 when she makes this so add it slowly and see what you prefer!). Mix well. You now have guacamole. Spread the guacamole over the beans. 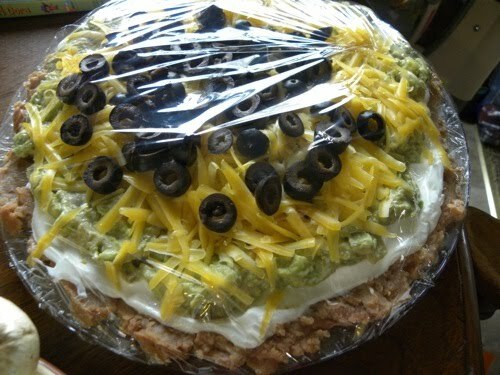 Grate cheese and spread over the guacamole. Sprinkle with sliced olives. Combine all ingredients in a bowl and mix well. Place in oven safe dish (or bread bowl: I usually prepare a loaf's worth of dough and bake it in a pie pan to get a round loaf, and then cut out the center after it's baked to make bowl for this dip!). Bake at 350 for 10 minutes. Enjoy with crackers or bread (it’s great on bagels the next day too!). You can adjust the garlic levels as you make it, because I do tend to like things that are very garlic-y! These look good. I'm making spicy slidders and patriot coffee cake. So excited! This looks DELISH. Seriously, I'm drooling over here. We have a stuffed mushroom recipe that is (dare I say?) even easier than the one you posted. 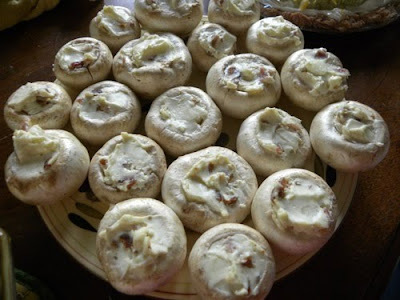 It's WONDERFUL if you are obsessed with goat cheese, like I am :) You combine 4 slices of chopped bacon (we use turkey bacon), add some chopped green onion, a little bit of garlic salt, and the stems of the mushrooms. Mix it all together, spoon it in the mushrooms, and bake. So good! !